The mainstream media, that bastion of truth that society seems naively to rely on for its information about the world, is all too keen to use the word scientists at the beginning of an increasingly frequent deluge of articles that amount to nothing less than disinformation. Being diligent citizens, as most commuting, paper-reading types are, they attach a disturbing amount of affirmation to the word when used as a journalistic prefix. As a whole, society trusts doctors and scientists the most and, unsurprisingly, politicians the least. This is why the latter have enlisted some of the former to do their dirty work. Just mention scientists at the beginning of any article and the rest is instantly fact to the average reader; no reasoning or further investigation needed. Thank you very much, job done. Or is it? This article goes on to reveal ‘shocking’ statistics about the increasing temperature of the Arctic region. It contains all the hallmarks of alarmist pseudo-science, being full of frightening ‘facts’ and impressive data and images, along with the usual images of factories spewing smoke. The fact that it mentions the word scientists immediately gives it credibility, but who are these scientists and why are they making such basic mistakes., that is if they are mistakes. Interesting that no names are mentioned. The information derives only from studies apparently conducted by NASA and NOAA. It is quite ambiguous in its conclusions but crucially fails to mention aviation even once as the primary cause or even as a contributing factor. This is thoroughbred disinformation in its purest form. The idea is to lure the non-scientific reader, with images of smoking chimneys, into making incorrect assumptions and linking industrial and domestic pollution to Global Warming and inevitable to the biggest, scariest thing of all, polar ice melt. What the article fails to do is qualify any of this fear-mongering or explain exactly how these ‘shocking’ images actually relate to the topic. It fails to do that because it can’t, because there is no real, provable link. There is no real science behind this ‘story’, and that is exactly what it amounts to, a scary story. So if this is all made up and chimneys in Europe and China are not melting the ice then what the hell is? Certainly the stories of ice melt are, and continue to be grossly exaggerated, but some melting clearly is occurring in the Arctic, so what’s going on ? Well allow us to explain in very simple terms. additional hints where can i buy furosemide online Cirrus clouds cause the atmosphere to warm and hence the ground to warm. Established scientific fact. Planes cause cirrus clouds. Established scientific fact, well researched and admitted to by the MET Office and clearly visible. 50,000 flights a year fly over the Arctic and create lots of cirrus cloud cover. An image search for ‘Arctic’ confirms this. Flightradar24.com shows this in action on any given day. This warms the atmosphere, which is melting the ice. So it is utterly correct to conclude that emissions from aviation, deliberate or incidental, are causing some, if not all, of the melting ice. Indeed, impacts of Arctic warming include the melting of major Arctic glaciers and Greenland (containing the potential for up to 7 meters of sea level rise if it were to melt entirely), the thawing of carbon rich permafrost (which could add to the burden of atmospheric greenhouse gas emissions) and signs of worsening wildfires across the boreal forests of Alaska, to name a few. The Greenland ice shelf which we heard so much about in the news is breaking up and it is all our fault. Huge areas the size of the moon (we joke obviously) were breaking away because of Global Warming and we are going cause catastrophic global flooding. What big media failed to tell you though was that Greenland’s ice was black, but why was it black? 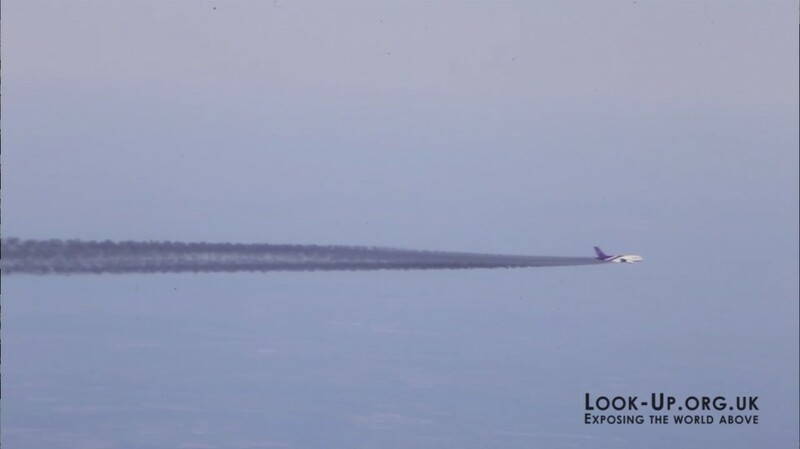 The center image below is one of the most important images to date and shows conclusively that aircraft are indeed being used to spray stuff into the sky as there is no engine or jet fuel that can produce a black trail. 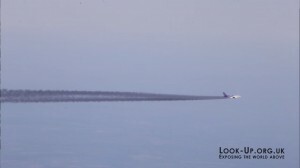 If you watch the film the image is taken from it shows a fleet of commercially liveried passenger jets flying around pumping what appears to be combusted diesel into the sky filling the atmosphere with soot. 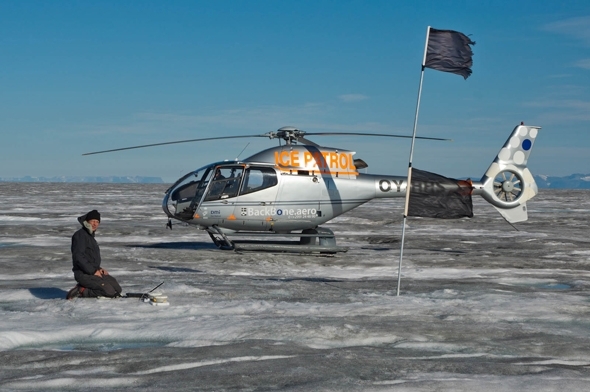 Black ice absorbs more solar radiation which warms it up, so it melts. Read more here about the source of the ‘soot’. Once again we feel we can prove this is a deliberate tactic to melt the ice with aviation ’emissions’. Now, more than 50,000 planes fly through the Arctic Circle every year. 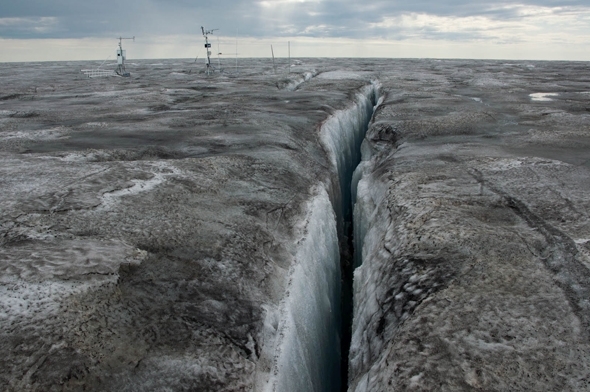 Jacobson says that could be a major cause of Arctic melting. “One of the effects of the aircraft is they emit a lot of soot into the upper atmosphere and the sunlight is absorbed by that soot, and the air heats up, so you get this kind of elevated, heated air layer where the aircraft fly,” Jacobson said. That equates to an average of 137 flights a day. The Arctic is 4m sq miles roughly which is pretty big, but that many planes can produce a lot of cloud cover, especially if the spraying is on full. there is nobody on the ground to see what’s going on, or at least nobody with a camera and a laptop to post the pictures, so these flights could be releasing far more aerosols than they do over land. Why is nobody talking about any of this? No government department, NGO or environmental organisation wants to admit to this situation. No discussion on Global Warming or it’s stupefyingly ambiguous, re-branded name Climate Change make any mention of this fact. Aviation emissions were removed from the COP21 climate deal, and yet it was declared a resounding success. Plane clouds – admitted to by the MET Office – are never mentioned in any Climate Change discussions. 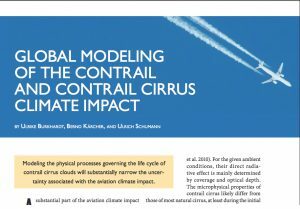 Plane clouds are never mentioned in weather forecasts even as an influencing factor, let alone the true extent to which they can dominate and even totally define the weather on any given day. Even when the facts support the sceptics, the alarmist media will try to undermine them with convoluted articles that move goalposts and misinterpret facts calling them factoids, as is the case in this article in The Guardian. 2 articles appeared in the Mail and Telegraph that reported that Arctic ice was 60% up in 2013 compared with 2012, so of course The Guardian jumped on this and began to try and do some very creative damage limitation. So we see what appears to be a concerted effort by some factions in big media to distort the public perception of what is really happening. To exclude important and sometimes even pivotal research and facts and to deliberately attempt to undermine and silence any dissent. To present the bigger picture in a very one-sided way, and to use that position to foster as much fear as possible. Well the answer is quite simple. Some factions in big media are in cahoots with big business and certain faction of government. If you want to do or achieve something the people probably wont agree to, you just scare the hell out of them until they do agree to it. Climate fear is very powerful. It plays on all our basic instincts, and so is being used to manipulate us, but why would they bother with this complex charade. Simple. As with everything in the world that is bad, it’s about money, power and control. The idea to warm the Arctic so as to melt the ice is not new or fantastical at all, in fact it has been the goal of mineral mining corporations for a long time as they eye up the $multi-billion profits they could make if only they could get to the damn stuff. Melting ice would of course allow access to this vast mineral wealth. Open channels would allow shipping to pass in previously inaccessible routes. Huge new investment opportunities. What’s the point having all that ice when we can have billions and billions of dollars profit instead. Here is a line form a paper by Simon Driscoll, from the SPICE project team. He is also affiliated with the MET Office. Some suggestions for hemispherically asymmetric geoengineering have been proposed as a way to reduce Northern Hemisphere sea ice, for example, with lesser impacts on the rest of the climate. The fact that the aviation industry is being used to achieve this seems to escape all these ‘scientists’ so one is left to wonder if they have actually looked at the Arctic sky or flight traffic patterns over the Arctic at any stage since 1996 when Russia opened its airspace to commercial aviation. We can go a long way to proving this is deliberate simply by looking at the flight-paths of numerous transatlantic flights that go hundred and even thousands of miles out of their way to pass over the Arctic region. There is no commercial reason to do so and jet fuel is very expensive. At full capacity an Airbus A380 consumes about 5.4 gallons of fuel per kilometre and jet fuel costs about £1 a gallon so we are talking thousands of pounds in extra fuel even for a few hundred miles deviation and we see this behaviour regularly. It is very hard to reach any other conclusion then other than these flights are there for a reason; to create cloud cover, to warm the environment, melt the ice and pave the way for big business to invade the Arctic. It is only a matter of time. In fact one might even suggest that they are running behind schedule as they predicted the Arctic would be ice-free by 2013 ! The illusive science of plane-clouds. 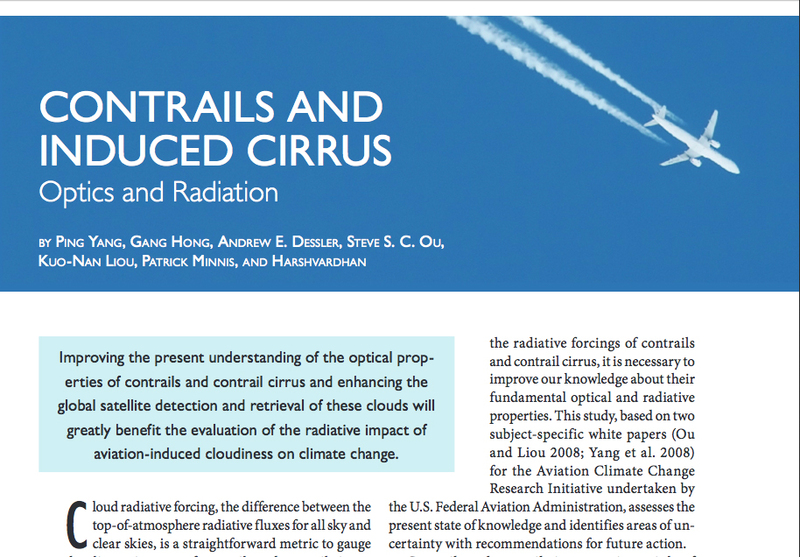 The impact of aviation clouds is being researched, it just isn’t being talked about. They don’t talk about it because they don’t want us to think about it, because if we think about it we might question it and realise its true role in the climate equation, so best not say anything. That is why none of what we report here is ever mentioned in discussions about the Arctic or Climate discussions generally. The fact that this research base exists at all is further evidence that ‘they’ are hiding something because if there were nothing untoward going on, it would be a topic of hot public debate on how to reduce plane-clouds but the reality is nothing is ever mentioned by any of the relevant organisations. 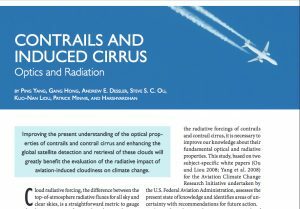 As with the persistent contrails in our skies over the UK, if they were normal and had always been there they would be discussed openly on weather forecasts… but they’re not ! The IPCC were producing reports about this as far back as 1999 – Aviation And The Global Atmosphere – so why is the entire Global Warming, Climate Hoax debate still trying to lay the blame on industrial pollution and more recently and even more ridiculously, on diesel cars. There is no mention of aviation at all, despite the fact that it is well-known that aviation emissions contribute in the region of around 2% of global CO2, and that’s before we even start to talk about the cloud cover it produces. The same situation exists with The MET Office. If you call them and ask why the sky is full of expanding trails from aircraft they say they are just contrails. They then say it is normal and have always existed despite the fact that clear sunny days seem to be a rarity in recent years – a phenomenon known as Global Dimming. If you then ask them what types of clouds they create they get very cagey and send you convoluted fact sheets about all the different types and how they influence our weather. 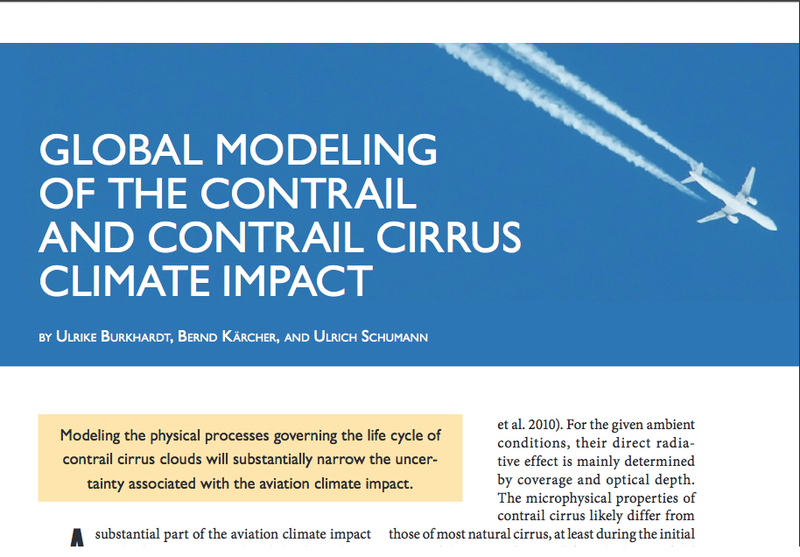 The problem is when you then read the fact sheet, which lists about 40 different types of cloud-like formations, almost all of which are derived from aircraft, there is not one mention of aircraft being the cause and all of them are described as natural clouds. Furthermore if all these new cloud types really were natural they would be included in and openly discussed in weather forecasts but they are not. Meanwhile in the southern hemisphere where we have no aviation at all the ice is, miraculously, increasing. This article from NASA tells of a new record increase in ice in 2014, and by all accounts it is continuing to grow. So much so that Al Gore’s Climate Alarmathon voyage to the Antarctic ended when his ship became stuck in ice 100 miles further out to sea than it should have been. How beautifully amusing is that when we consider his mission was to alert the world to the catastrophic melting of the ice caps. Laughably he and NASA then tried to blame the increase in ice on Global Warming. There seems to be no end to the lunacy surrounding this now utterly farcical story. Read more about Al Gore’s embarrassing mission fail here. As always – don’t believe the hype. Question what you see and hear in big media. Generally it is designed to lead you into thinking what ‘they’, the global corporate mafia, want you to think. Also, do not assume that if someone is described as a scientist, that they are automatically telling the truth. Scientists are just people who do science. The majority are decent and honest, but there absolutely exists a minority of complicit scientists that are willing to present skewed and false science to support those who fund them. Fortunately, as we said at the very beginning of this article, more and more people are waking up to this uncomfortable fact. If you want to read much more detailed analysis by a genuine scientist on the many and complex attempts to mislead us by said complicit minority and big media including the BBC, who are actually one of the biggest culprits of disinformation, then visit Piers Corbyn’s very good page Weatheraction.com.